Strengths-Based Therapy: Distinctive Features　offers an introduction to what is distinctive about this innovative client-directed approach. Written by two　experienced　practitioners of strengths-based therapies, this　book translates SBT principles and practices into concise, evidence-based ideas and techniques that mental health practitioners can immediately apply on the job. 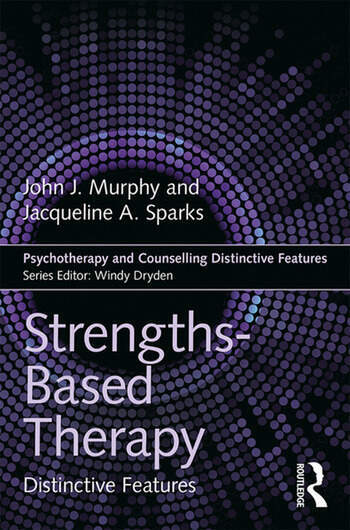 Using the popular Distinctive Features format, this book　describes 15 theoretical features and 15 practical techniques of Strengths-Based Therapy. Strengths-Based Therapy　will be a valuable resource for psychotherapists, clinical, health and counselling psychologists, counsellors, psychiatrists, marriage and family therapists, social workers,　and all who wish to know more about this unique approach to therapy. 2 SBT as trans-theoretical and value added ………..……………………………………..
3 Clients as heroes of change……………………………………………………………..
4 SBT as client directed…………………………………………………………………..
5 SBT and therapist factors……...………………………………………………………..
6 SBT and the therapeutic alliance………………………………………………………..
8 SBT and social constructionism……………………….………………………………..
9 SBT language and practices ...…………………………...……………………………..
10 SBT and diagnosis ………………….…………………………………………………..
14 SBT and client feedback ………………………………………………………………..
15 Challenges of SBT practice ……………………………………………………...……..
Part 2 DISTINCTIVE PRACTICAL FEATURES OF SBT………………………………. 16 Being respectfully curious ……………………………………………………………..
19 Exploring clients’ theories of change …………………………………………...……..
20 Exploring clients’ desired future ………………..……………………………………..
21 Recruiting client resources ……………………………………………………………. 23 Asking resilience and coping questions …………………………………...…………..
27 Collecting systematic client feedback ………………………………………………..
30 Acting for social justice …………………..…………………………………………..
John J. Murphy, Professor of Psychology at the University of Central Arkansas (USA), is an internationally recognised clinician and trainer of client-directed, strengths-based therapies. His books have been translated into multiple languages and he has trained thousands of helping professionals throughout the world. Jacqueline A. Sparks is a Professor of Couple and Family Therapy in the College of Health Sciences at the University of Rhode Island (USA). She has written and trained extensively on the use of systematic client feedback in psychotherapy to promote client voice and choice.